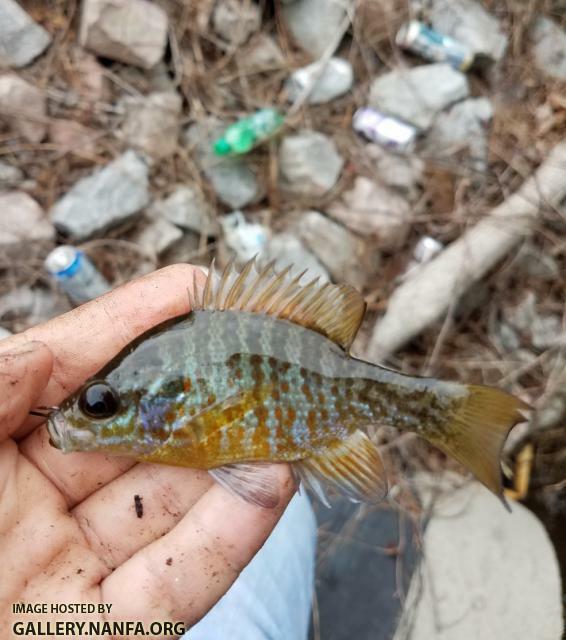 I caught this small sunfish a couple of weeks ago in a small creek in Lexington, SC. In the past, I have caught Bluegill, Warmouth, and Pumpkinseed in the same creek. I was wondering if this is a juvenile of one of those, or maybe a hybrid? Hey guys... nviole knows he needs a picture, but is having some problems with the forum... I asked him to try his post even if the picture did not load for him.. so that I could see his post and try to figure out how to help him. Here's the pic sorry for the confusion. I'd vote pumpkinseed. BTW, a closed mouth is better for ID purposes. Stunted based on eye diameter / total length ratio. Hybrid with Pumpkinseed or Redear in it. Not a Pumpkinseed x Redear. Orange spots on flank indicate Pumpkinseed. Pattern on opercula suggest a Bluegill also in woodpile as does the long dorsal spines. Warmouth and Green Sunfish hybrids will have shorter dorsal spines and larger mouth. Pumpkinseed x Bluegill or Bluegill x Pumpkinseed. As much as I hate to say the word hybrid and I don't know that I have ever seen a hybrid around Lexington, I have to agree with Centrarchid. It appears to be a pumpkinseed X something, either bluegill or warmouth. I need to take you out to some streams I piddle around in. Hybrids are seldom abundant, but they are also not rare. Greens and Longears really like to mix it up and it may have nothing to do with habitat degradation or difficulty in finding a mate. Cuckolders are doing the nasty in the wrong nest. Maybe its because we don't have longears at all and greens are very rare. Pumpkinseeds aren't exactly common either. I assume your sunfishes are not regularly forming mixed species colonies. Coppernose do things differently than Northerns for sure. In many more northerly locations large colonies can sometimes have four species breeding at same time. What creek do these come from? Up here we see greengills quite often. Some are surely escaped from pond stockings, but not all. A lot of retention ponds have wild swings in water levels. At least in my area. I could see that type of adversity precipitating hybridization. All the fish trying to spawn in a rapidly shrinking habitat.